As with many of these posts – this is more of a “note to self”. 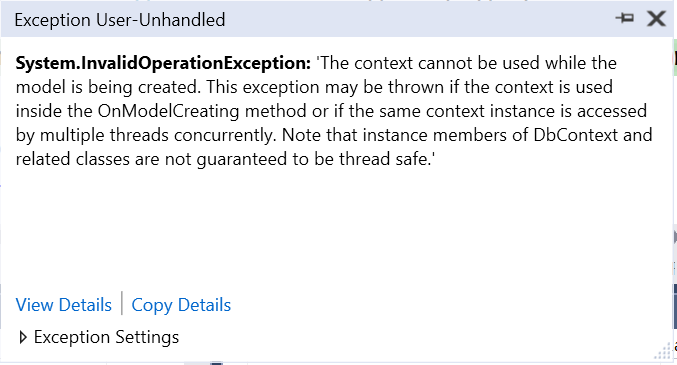 warning xUnit2012: Do not use Enumerable.Any() to check if a value exists in a collection. 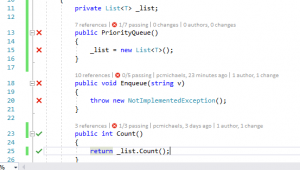 This entry was posted in C#, Short Walks, Unit Testing and tagged Do not use Enumerable.Any() to check if a value exists in a collection, Unit Test, XUnit on April 14, 2018 by pcmichaels. I’ve had this issue a few times recently. Each time I have it, after I’ve worked out what it was, it makes sense, but I keep running into it. The resulting frustration is this post – that way, it’ll come up the next time I search for it on t’internet. You can now test the behaviour on MyClass, via MyClassMock; however, you still can’t* override the method ReadNumberOfRowsInFileOnDisk() because it isn’t virtual. If you make the method virtual, you can override it in the subclass. The same is true with NSubstitute – if you want to partially mock a class in this way, it follows the same rules as you must if you would to roll your own. * There may, or may not be one or two ways to get around this restriction, but let’s at least agree that they are, at best, unpleasant. This entry was posted in Unit Testing and tagged ForPartsOf, Mock, NSubstitute, Substitute, Unit Test on January 3, 2018 by pcmichaels. 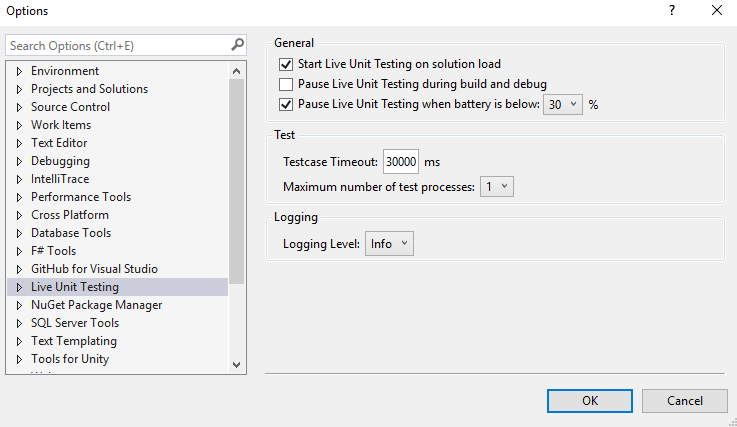 While working on this project, I decided that I would see how useful the new feature of “Live Testing” is for TDD. As you can see, there are some slight contradictions here in what it’s telling me. 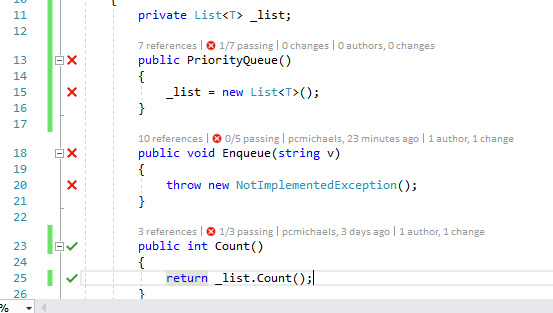 The first test is failing, the test for Count has a line (which indicates not covered). 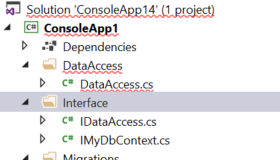 However, code lens is telling me there are two covering tests. 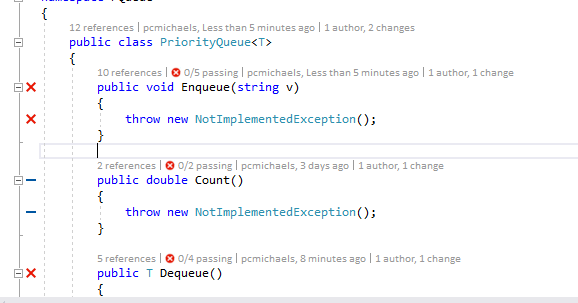 My thoughts are that the engine works out where the test fails, and so, in the case above, it’s telling me that the tests are not running the line of code that tests the Count functionality. What I’m guessing is that this is because the tests are failing before that. 2. If the build fails, it shows nothing. 3. 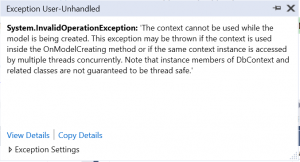 Live testing is only available in Visual Studio Enterprise. One thing that only occurred to me as notable while I was writing this is that the tests that I’ve written are in NUnit. 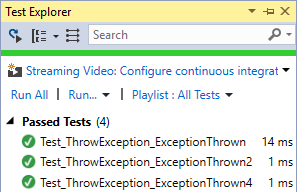 So the Live Testing clearly works with none MSTests, and probably works with anything that’ll show up in Test Explorer / Code Lens. 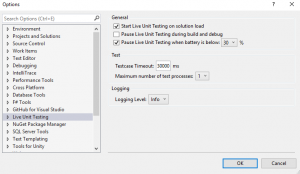 This entry was posted in Unit Testing, Visual Studio and tagged Live Testing, MSTest, NUnit, TDD, Test Coverage, Visual Studio, Visual Studio 2017, Visual Studio Enterprise on April 30, 2017 by pcmichaels. 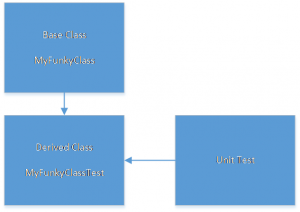 Unit testing massively benefits from following the Arrange / Act / Assert pattern. 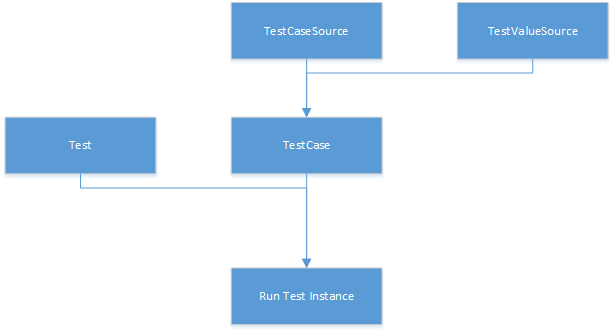 I’ve seen tests that are not written in this way, and they can be sprawling and indecipherable, either testing many different things in series, or testing nothing at all except the .Net Framework. Now I’m not so sure that I still prefer the anonymous function. 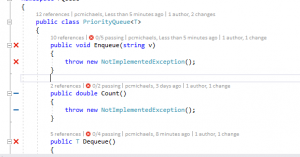 This entry was posted in C#, Unit Testing and tagged Act, Action, Arrange, Assert, C# 7, Local Function, NUnit, TestDelegate, Throws, Unit Test on March 14, 2017 by pcmichaels.